The personal benefits and values of the core product are reinforced and strengthened as the brand meaning grows and it becomes more connected to the person. In the language of a brand manager, the result is a high equity brand that is surrounded by loyal customers. To flesh out a brand design schematic, researchers often integrate means-end research with other forms of marketing or consumer research. Hierarchical Value Maps: Hierarchical Value Maps based on the means-end analysis identify the connection between the brand attributes and the market needs. These are expressed as personal benefits of brand use and values that are reinforced and give creative directors a rich set of concepts for producing advertisements. To sell a product we must “play to strength,” but often that strength is not valued by people. Our “strength” is a “so what.” The goal of market driven strategies is to change the “so what” into a “WOW.” One way of doing this is to use means-end analysis and hierarchical value maps. The following example shows a portion of a hierarchical value map for a bank considering how to position its credit card. The means-end study was used to produce a hierarchical map based on a set of attribute statements that were linked to positive and negative psycho-social consequence statements (benefits). Higher order value statements were also used in the study and appear at the top of the map. This portion of the hierarchical value map clearly shows two psychological values as key to credit card users: “Peace of Mind” and “Self Esteem.” Peace of mind is a direct result of the card being broadly accepted by merchants and the support locations available. These credit card attributes are seen to link, in turn, to independence, dependability, and security. 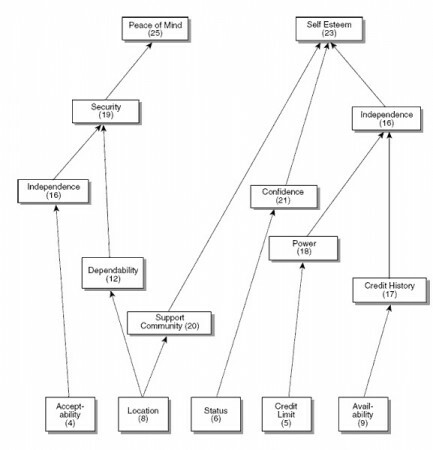 The branch of the hierarchical value map dealing with Self Esteem is similarly interpreted through the linked positive benefits and associated attributes. Understanding the values behind the brand will help you better conduct your research.